Wash drawing by Murugesa Moodaliar of two fragments of railing coping from the Great Stupa of Amaravati. This is one of 42 sheets (89 drawings) depicting sculpture from Amaravati and S. India. Inscribed with numbers 2 to 90 (1 is missing) and with measurements; signed:' P. Mooroogasa Moodr', dated c.1853. 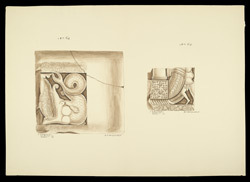 The drawing No.64 depicts the relief carved on the outer face of the remains of a railing coping representing a thick garland issuing from the mouth of a makara, a mythological sea-monster. The drawing No.65 depicts a small fragment of the outer face of the rail coping showing a running man carrying a thick garland and a square panel decorated with a pattern of svastikas and lotuses. Above this panel there is a stupa symbol of the Death of the Buddha. The two fragments are assigned to the early part of the High Period of sculptural activity at Amaravati, 2nd century AD.